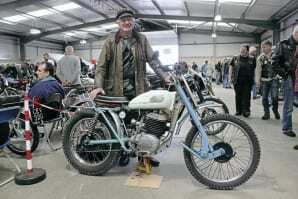 Frank Kay bought this hard-used Greeves Hawkstone scrambles bike in 1980 and registered it for the road. It was a sharp contrast to the previous week, when the annual Ashford Cattle Market event had been hit hard in the aftermath of storm Katie. While there were a number of regularly attending bikes, organiser Julie Diplock pointed out that, of the prize-winners at Ardingly, almost a third were first time entries.